Derek Mosley II posted this photo on his social media account prior to Wheelersburg’s game vs. Middletown Madison Saturday night. Videographer Derek Mosley II was found to not have relayed play calls to Wheelersburg coaches during the Pirates 24-16 win in the Division V Region 20 championship game vs. Middletown Madison Saturday night, according to Wheelersburg administration and the OHSAA. Madison superintendent Lisa Tuttle-Huff was on the sideline and alleged she heard Derrick Mosley II say out loud, “Two man wide,” as Madison was about to begin their final plays of their drive in the Division V Region 20 championship game. “It’s interesting because I can’t tell you if the boys had even moved to ‘two man wide’ at that point,” Tuttle-Huff said, according to an article published by the Journal-News regarding alleged illicit activity during the Division V Region 20 championship football game Saturday night between Wheelersburg High School and Middletown Madison Senior High School. Tuttle-Huff, Madison head football coach Steve Poff, Madison’s athletic director Matt Morrison, school board member Chad Norvell, and members of the Madison staff made an unannounced visit to the OHSAA headquarters in Columbus on Monday to plead their case for what they believe to be a ploy by Wheelersburg coaches and Derrick Mosley II – a videographer – to relay play calls from the Madison sideline via Mosley to the Wheelersburg coaching staff. According to the report, Mosley was alleged to have had a microphone up his sleeve and appeared to be discussing what formations Madison would be running with someone who Mosley later claimed to be his wife, and that the conversation was just a regular phone conversation. Madison officials felt there was strong evidence that Wheelersburg was attempting to gain an unfair advantage by having eyes and ears on the opposing sideline. Mohawks coach Steve Poff said when Mosley was approached by his coaches, he said he was talking to his wife. But when the group from Madison made the unofficial visit to the OHSAA on Monday, they were told by their own lawyer and later the OHSAA that their claim Mosley was guilty of alleged conduct had no ground to stand on. Another excerpt from the story read, “Thanks to an earlier email from Tuttle-Huff, the OHSAA had already contacted several Wheelersburg officials, who denied any wrongdoing. Mosley sent his video clips to the OHSAA, and Madison officials then got a look at them. “They were edited films,” said Tuttle-Huff, noting that the parts Madison needed were missing. She said the district wanted to try to get a temporary restraining order in court, but that idea was nixed when its lawyer said there simply wasn’t enough evidence to support it. On Tuesday, the Daily Times was given a statement by the Wheelersburg administration, which was approved by the OHSAA, denying that any communication between Mosley and the Wheelersburg coaching staff took place during play of the Region 20 championship game. The release went on to say that the Wheelersburg administration hopes this issue can be moved on from, as well as thanking their community for their constant support while their focus shifts to Saturday night’s contest with Johnstown-Monroe. He also denied the act of sending doctored or edited films to the OHSAA from the scenes that he shot during Saturday night’s regional championship game. Mosley went on to give his recount of the alleged incident that took place between himself and those on the Madison sideline following the game, stating that he was on the phone with his wife when he noticed a woman to his left and a man to his right attempting to listen to his conversation. After a few minutes, the man allegedly went to Madison coaches who then proceeded to physically shove Mosley’s shoulder and ask Mosley why he was on their sideline with a Wheelersburg pass, ask who Mosley was talking to, all while Mosley was allegedly having a conversation with his wife. As for the headphones in his ears, Mosley did say that he owns a pair of Apple Airpods, which are wireless, and that he was wearing them during the game. Mosley is also alleged by the Madison officials to have been sporting a Wheelersburg pink team pass, rather than an OHSAA credentialed green media pass which granted field access. Mosley himself did not deny this allegation, instead offered his version of the events that led to him having to get a Wheelersburg team pass. “She didn’t have a premade pass for him, so she looked for a blank media pass and couldn’t find one,” said Ruth Boll, a local newspaper photographer who happened to be behind Mosley when the event took place at the credential table just outside the Hilliard Darby Stadium, “She did find a blank team pass, wrote his name at the bottom of it, and said, ‘That should be good for tonight’,”. 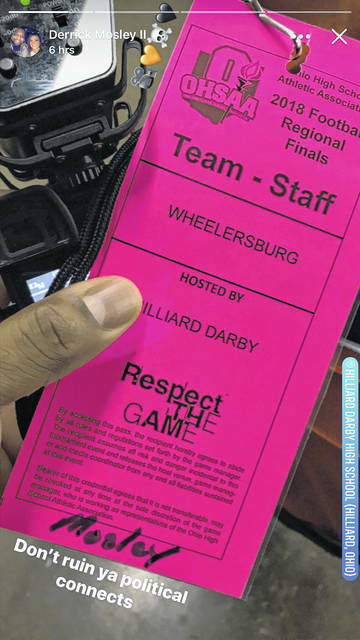 In a social media post made by Mosley the night of the game, a picture taken by Mosley himself shows the pink team pass that says at the top, “Team – Staff: Wheelersburg” with Mosley’s last name written at the bottom of the pink card, underneath of which was self-added text which read, “Don’t ruin ya political connects”. The story also alleges that Wheelersburg head coach Rob Woodward was indicated as saying to the Madison coaching staff that he did not know who Mosley was, even though Mosley is supposed to be the team’s videographer. Mosley said he was confused as to why Poff would allege Woodward said this, stating that him and Woodward have conversations when Woodward is not preoccupied by actions involving his team and the game at hand, and also stated that Woodward himself signed off on Mosley being allowed to film Wheelersburg practices, games, locker room audio, and other Wheelersburg football events. The article also makes the claim that prior to the start of Saturday’s game, on the field personnel wearing Wheelersburg apparel came to the Madison sideline and asked to take Madison’s footballs to the officials of the game to have them checked before play began. The Daily Times extended the Wheelersburg administration and athletic staff the opportunity for an interview to discuss the other material in the article in statements made by Tuttle-Huff and Poff, rather than just the communication between Mosley and the Wheelersburg coaching staff as addressed in the statement. Wheelersburg athletic director Jarod Shaw responded to the interview request by stating that while the Wheelersburg football team is still in the playoff hunt and will be competing Saturday night in the Division V state semifinals, the Wheelersburg administration feels it best to give no comment on all other allegations in the article to best limit distractions for their football team. The Daily Times also attempted to contact Tuttle-Huff to discuss the content of the article written Monday night and received no response. 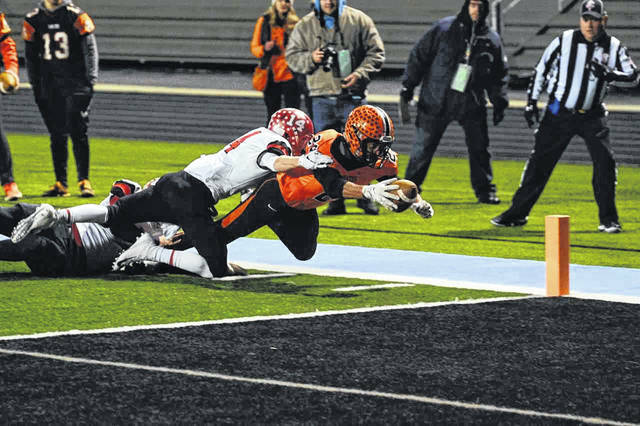 Wheelersburg is set to kick off their Division V state semifinals matchup with Johnstown-Monroe Saturday night at Alumni Stadium in Jackson at 7:00 p.m.
Excerpts are from a published article written by Rick Cassano, the Journal-News, a publication of Cox Media on November 19, 2018.